The Taipei MRT System is pretty much the best thing about Taipei. Seriously. I’ve thought about this a lot. It’s a very modern, award winning subway system that will whisk you almost anywhere you want to go in this sprawling city in minutes. It’s clean. It’s convenient. It’s never late. It’s cheap. It’s easy to negotiate, even in English, Japanese, or Korean… It’s awesome. 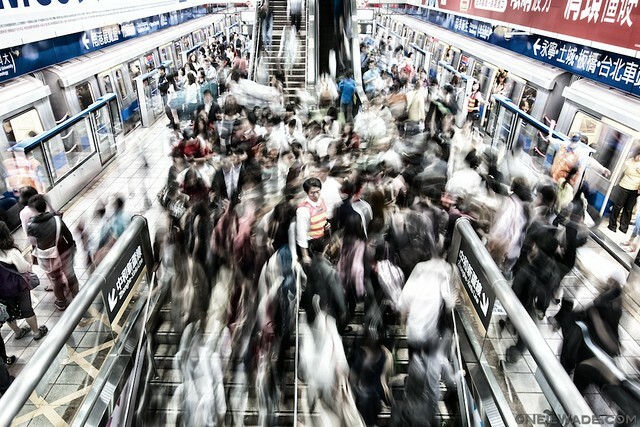 The one complaint I think anyone would have for the MRT is that it can get very crowded at peak times. The biggest trouble spot used to be the transfer at Main Station, but since the Fuzhou-Nanshijiao (Orange) Line opened, the dreaded transfers now seem to be at the Zhongxiao-Xinsheng and the Zhongxiao-Fuxing Stations. So, despite my love of the MRT, I present you with a photo essay based (mostly) about the crowds and flow of pedestrian traffic during peak hours. The transfer from the Blue Line to the Orange Line at Zhongxiao-Xinsheng Station can be hectic, but MRT employees are there to help out. 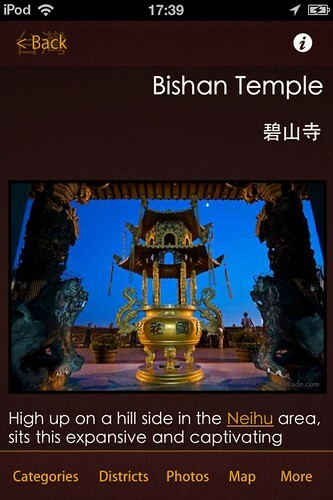 Taiwan Adventures iPhone Guidebook is a brand new way to learn about Taiwan as you travel through it. 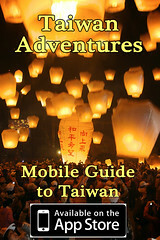 The “book” has over 900 entries featuring Taiwan’s best travel highlights. Useful to tourists and expats alike, the APP has entries describing everything from renting a car or scooter to finding that western food that you’ve been craving. A sample of the Guide is a downloadable from the iTunes Store for free. Several of my colleagues and I have been working on this guide for nearly a year now. 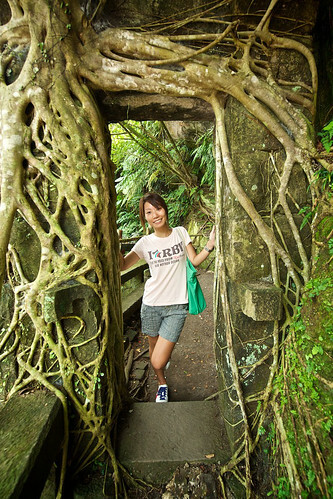 We’ve traveled to nearly every corner of Taiwan to find you the most interesting places, both famous and unknown. We’ve tried to push our favorite part of Taiwan – its amazing natural beauty, but have also scoured the cities for the best they have to offer. You can get a small sample of the Guide for free from the iTunes Store, then the five divisions of Taiwan (Taipei City, Northern Taiwan, Eastern Taiwan, Central and the South) are a small additional fee. All the entries have several photos (over 2,000 all together), many of which are exclusive to this APP. The Taiwan Martyrs’ Shrine (officially The National Revolutionary Martyrs’ Shrine 國民革命忠烈祠) is set on the side of Qingshan Mountain very close to the Grand Hotel and the neighborhood of Neihu (內湖區). It’s hallowed ground, dedicated to those who fought and died for the Republic of China in the Sino-Japanese War, the Chinese Civil War and the First and Second Taiwan Straight Crises. About 390,000 soldiers died in these wars, and their spirit tablets can be found here. Twice a year, the President of Taiwan and high officials come to the Martyr’s Shrine to pay their respects to the fallen war heroes. But what many people come to see is the changing of the guard ceremony, which happens every hour on the hour. 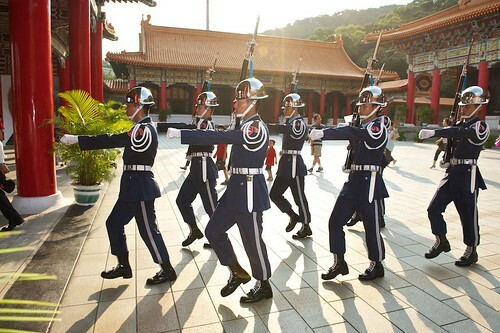 See military precision at the Martyrs' Shrine in Taipei. My series of blog posts on hiking The Four Beast Mountains has become one of my most popular series since I’ve started blogging. Now that spring is back upon us, I’ve noticed that those posts are getting more and more hits. I can only guess that everyone is looking to get get some exercise! So here’s a new post. It’s going to be mostly just pictures, but they are all from an area that I glossed over in the last three posts. The general Yongchun area consists of two high schools, a small military base, several temples, and a few apartment building neighborhoods. The entire basin of this area (roughly 600m x 100m) was a shallow lake just a hundred years ago or so. 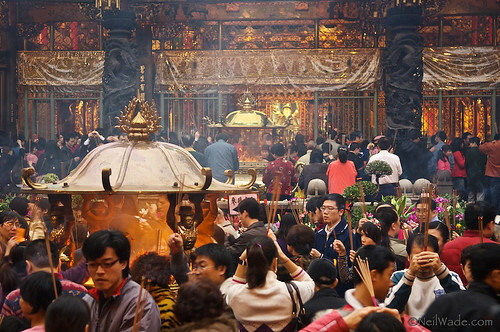 Longshan Temple 龍山寺 (aka Lungshan and Mengjia 艋舺龍山寺) is the oldest and most well-known temple in all of Taiwan. What’s truly wonderful about it, is that despite being a major tourist destination, Longshan Temple retains it’s charm and genuineness by remaining a place of daily worship. The area around Longshan can be quite interesting as well, and features traditional markets, calligraphers, traditional medicine shops, fortune tellers, and a place called Snake Alley. All these reasons and more are why Longshan Temple is on my list of must see places in Taipei. Throngs of Buddhists and Daoists pack Longshan Temple in Taipei on Chinese Lunar New Year 2007. Here are my most recent “random” images from Taiwan. It’s quite a mish-mash this time with images from the beach, the mountains, the city, a drainage ditch in Banqiao, and even one from a night club. 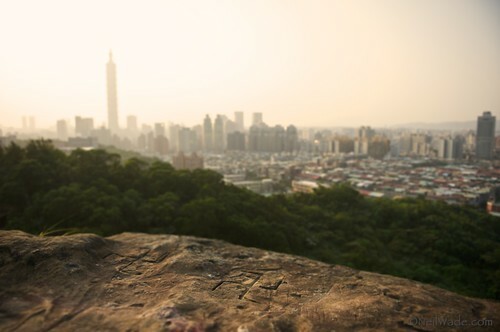 I’d like to take a moment to thank everyone over at Taiwanderful.net for holding the yearly “Best Taiwan Blog Award”. I’m very honored to report that I’m a co-winner this year for the Best Overall Taiwan Blog and the Best Taiwan Photography Blog! I’ll be sure to keep up the posting and I have a few new blog posts simmering that I should be able to put up in the near future. Thanks everyone! 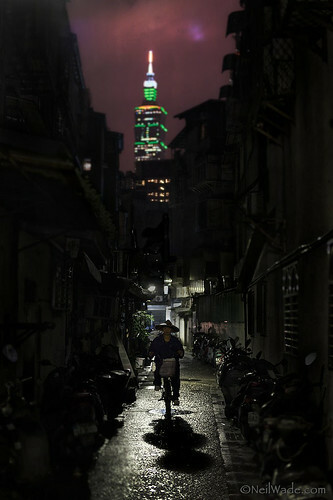 Old world meets new in a Taipei, Taiwan alley. Had a great time shooting some beautiful light tonight so I though I’d share. 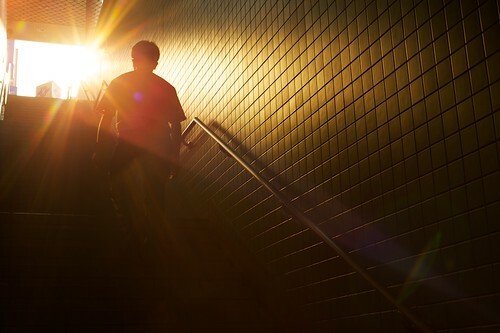 The following photos were all shot within about a 30 minute period in the late afternoon here in Taipei. I shot 270 images in that time, and decided to share the best here, and make a video of the rest. Every image was made with a 50mm lens set at various settings and they were only lightly retouched in post. They’re all in chronological order, except for the first one. What’s important though, is to look at the light, how it changes, and the things that can be done with it. Shiding (石碇) and Shenkeng (深坑) are two small towns found just to the east of Taipei, Taiwan. They’re both withing 3o minutes of Taipei’s convenient MRT system and together, they make for a great day trip out of the city. 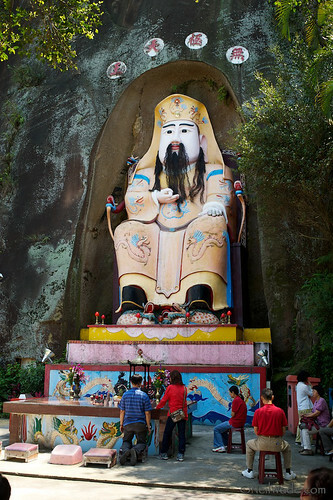 Shiding is a simple mountain village located at the convergence of two small mountain streams. It’s got an old-time Taiwan feel to it, and in fact has many stores that are over a century old. It also has two very clean, fish-filled streams that come from virgin forests high above, in the nearby mountains. Doorways don't get much cooler than this. I went on another weekend hike with Stu recently, this one to Xiaozi Shan (孝子山) and its nearby mountains located just to the south of Pingxi (平溪), Taiwan. We had a good time as usual, enjoying the first rain-free Sunday that Taipei has seen in months. XiaoZi Shan and it neighboring mountains, Cimushan (慈母山) and Cimufeng (慈母) are all just a few minute’s hike from the 106 highway and downtown Pingxi. They all feature sheer-rock faced peaks with awesome views of the surrounding mountains and the Pingxi valley. What’s unbelievable about this area, is that all of the peaks are accessed by a trail “intersection” that has 4 different trail heads withing 40 meters of each other, and the peaks are all within a 30 minute hike from there! 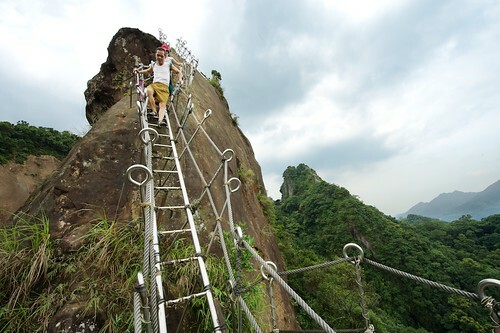 A couple of men descend from the peak of Xiaozi Shan (孝子山) on a aluminum ladder in Pingxi (平溪), Taiwan. I’m pretty sure that most people in Taipei don’t realize that they live at the base of a volcano. What might be even more unsettling is that all indications show that there are still active magma cambers under northern Taiwan. 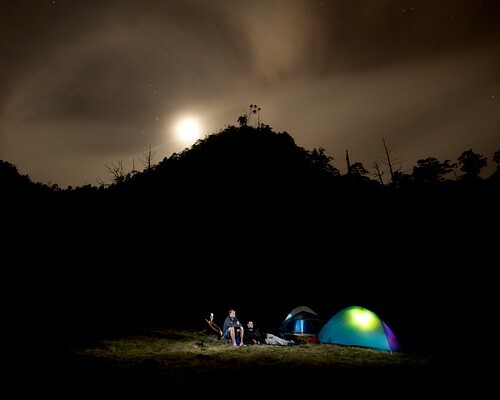 The Tatun Volcanic Group 大屯火山群 is a group of volcanoes that make up most of Yangming Shan National Park 陽明山國家公園, the large mountainous park that is just to the north, but technically within Taipei City limits. The largest is Qixing Mountain 七星山 (Seven Star Mountain) at 1,120 meters (3,675 ft); the next is Datun Mountain 大屯山 and there are many smaller parasitic volcanoes whose peaks can be seen around the park. 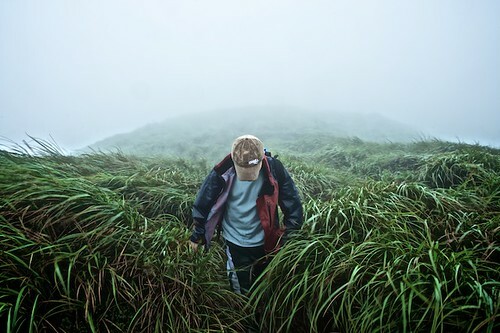 A hiker in a rain storm walks through tall grass in Yangming Shan National Park in Taipei, Taiwan. ”Cosplay” is a combination of the words “costume” and “play”. In Taipei, it’s an event held about twice a year at NTU in conjunction with a manga (Japanese comic books) exhibition called Fancy Frontier. 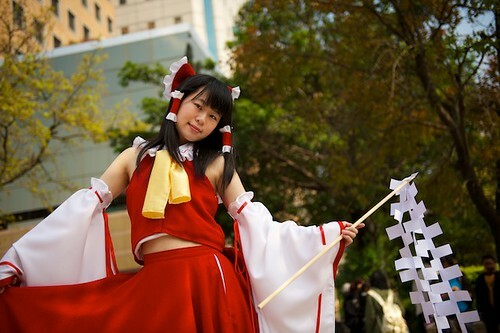 During a cosplay event, people dress up as their favorite manga character and parade and pose for photographers. It began as a Japanese phenomenon but it’s caught on in many other places in the world, including Taiwan. A girl poses while dressed in a "cosplay" costume at National Taiwan University in Taipei, Taiwan. The Taipei Jianguo Jade and Flower Markets (建國假日玉花市) are a must-see for anyone in Taiwan. Located next to each other on Jianguo South Road, the two markets stretch for nearly a kilometer (1/2 a mile) under the elevated highway. They are only open on weekends and can make for a wonderful escape from Taipei’s often dreary rain. But even on a sunny day, the Jade and Flower Markets (along with the adjacent Daan Forest Park) make for a nice afternoon walk for tourists and locals alike. 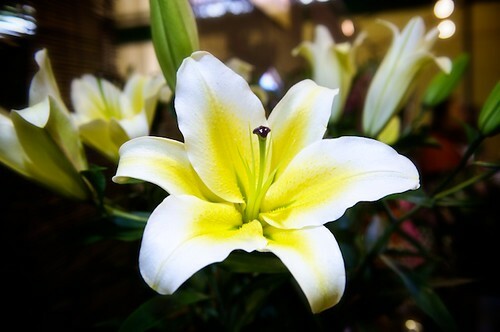 A big, beautiful lily for sale at the Taipei Flower Market. As a pre-opening event for the Taipei Deaflympics, a company called New Substance put on a fantastic performance with acrobats on cranes, a girl hanging from a helium balloon and colorful dancers in a strange bungee-box. It was very reminiscent of a Circ-De-Solei performance, but all for free! I shot it in conjunction with Craig Ferguson who also blogged about it, so I’ll save myself some typing and let you read more details about it over on his site. 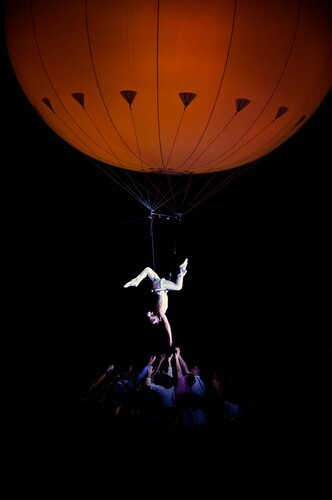 A pre-opening event for the Deaflympics in Taipei, Taiwan, New Substance put on a beautiful, dreamy, circus-like show. This girl is flew on a helium filled balloon high above the audience and would sometimes come down to touch their hands.